Summary: This atmospheric 1940s horror still packs a punch. “This is horrible, unhealthy stuff!” someone declares midway through Lewis Allen’s 1944 shocker. The Uninvited doesn’t seem particularly horrible or unhealthy now – particularly compared to later fright-fests such as The Innocents and A Place of One’s Own – but as one of the first Hollywood ghost movies it paved the way for later, scarier fare, and it boasts a handful of scenes that still pack a punch. 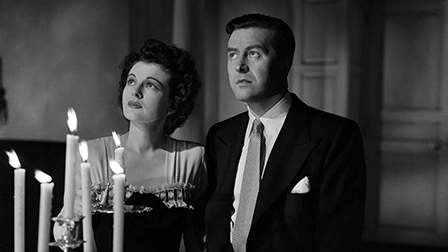 Ray Millard plays Roderick Fitzgerald, a composer who, seemingly on a whim, decides to purchase a gothic clifftop mansion in Cornwall, along with his sister Pamela. The pair buy it for a knock-down price from the ageing Commander Beech (Crisp) – but is there a reason for the bargain price tag? Well, yes. The siblings’ peace is soon interrupted by a series of mildly troubling occurances: their dog barking at the air, flowers mysteriously dying, doors closing by themselves, creepy sounds piercing the night. And then there’s the Commander’s earnest, bossed-about granddaughter Stella (Russell), who keeps popping up at the house, convinced that the spirit of her dead mother stalks the place – much to her grandfather’s consternation and Roderick’s pleasure. It takes time before The Uninvited gains any real momentum. Instead of building up a slow-burning atmosphere of dread, director Allen and screenwriters Frank Partos and Dodie Smith (author of 101 Dalmatians) choose to waste time with annoying sub-screwball banter between Roderick and Pamela, accompanied by wacky music and a tedious squirrel chase. Yet after the first half-hour, it beds down into a reasonably involving chiller, though it’s as much Rebecca-influenced psychodrama as it is all-out spook story (at least until the terrific finale). Charles B. Lang’s cinematography is particularly atmospheric in the night-time scenes, with shadowy staircases, flickering candles and characters bathed in moonlight against windows, and the special effects, when they do arrive, remain impressive today. Like all classic ghost stories, it also features a gripping séance sequence. The Uninvited is perhaps most famous for being the film that introduced the world to Victor Young’s jazz classic Stella by Starlight. Aside from the standard stills and trailers, you get an exclusive illustrated collector’s booklet.